An Ebike or a Scooter? The Audi eBike should be Maui Bike Rental! An image of the Audi electric bike. Front View of the futuristic Audi e-bike. 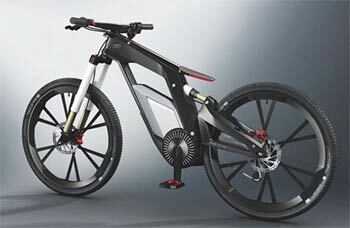 Check out the Audi e-bike press release and a couple larger images. Use the comments below to let us know if you would rent one of these high performance e-bikes on Maui? OK, so we can't rent the newest e-bikes from Audi or Specialized yet. Our West Maui bike shop offers high performance road bike rentals and full suspension mountain bikes and Specialized HT 29'ers. It's easy to make a rental reservation: Just choose a bike, then pick it up at our West Maui bike shop. Reserve a Bike Rental on Maui NOW!